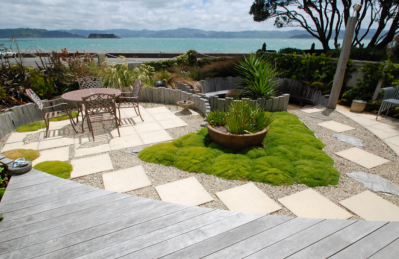 Home > blog > Windy, exposed garden in Wellington? – It can be an asset! People who live in Wellington know that we endure a lot of wind so having a garden that is practical and useable in the wind would be a great garden to have. We have an extremely windy and exposed section. Can you make that work for us?? Of course I can help, for the last 20 years I have lived in Wellington and by the sea! I lived firstly in Eastbourne which was quite sheltered admittedly but I did a lot of beachfront coastal properties in Eastbourne which got gale force winds from the north and the south and of course coastal salt. Then just to really cut my teeth I moved to Makara about 6 years ago and really got taught a thing or two about wind. It’s a pretty mean place in a northerly and we are surrounded by a wind farm. The wind flies along the cliffs then gets funnelled so a 30 knot wind at sea is a 50 knot wind in the funnel and we live in it! But regardless of that it is a fabulous place to live and I have been taught a lot about wind from living there. Working with the wind not against it. I have become supremely confident in my abilities to help people with exposed sections. How to deflect it over and away from the areas you want to use. Often it involves way more than just planting and the plants you plant. With really windy sites in Wellington we have to build structures which I design in such a way to deflect and defuse and lift the wind away from the areas you want to use. There are many tricks of the trade. Planting of course, finding plants that will survive is one thing but to be honest, some of the windiest sites, it’s all very well planting a plant that is tough but if it is really wild out there the wind will pull it out of the ground before it has even put it’s roots in so the toughness of the plants is the least of your concerns. So I employ lots of different techniques to getting the front line planting established. How we plant them and get them established. I tuck plants behind things like boulders and low wind screens. With one really windy site I actually formed baffles -rows and rows of wind cloth which creates a grid so the wind is baffled by the wind cloth. This allows the pants to grow and once a canopy has grown then you can actually take the wind cloth away. This is a 2/3 year process. I put these every metre and a half with wind cloth because it was so extreme. The person who lived there had lived there for 16 years and he said No we can’t have a garden here, nothing grows. I said it will grow you just have to do what I say, he has a garden now! You can’t see his fence as it is completely covered with plants. Now they can plant more interesting plants underneath, the first line of defence planting is often very boring ngaio, flax etc. Once that is established you can plant lots of things. I have a lots of interesting things in my garden. People often laugh and say wow thats the first time I have seen a fig tree in Makara. I am very comfortable designing windy gardens.